Whether you're taking on a big or small residential remodel, house painting can completely change a room. A new color can make a dark room look cheerful, a drab room look bright, and a childish room more adult. Unfortunately, painting can be a time consuming and tedious process. From the set up to the clean up, painting can take many hours or even days, depending on what is being painted and how many people are working on the project. If you're a homeowner, it helps to know what you're getting into and how you can save time. Renovating your house is a good way to boost property value and improve quality of life in your house. In the summer, many homeowners choose to make renovations that make life more comfortable in the heat or make entertaining easier in the home. Summer is, after all, a season for spending time with loved ones, enjoying good food and beating the heat. As the summer gets going, we start to see a sharp increase in renovation projects that improve HVAC performance, add space outside for entertaining and so on. Remodeling your bathroom can improve the value of your home and make your property more appealing to buyers. In a house with a dated bathroom, remodeling can help bring the property into the modern era. A newly remodeled bathroom looks cleaner, is easier to maintain and is less likely to experience plumbing problems over time. These reasons and many more are all the factors that homeowners consider when they decide to remodel their bathroom. In the last several years, bathroom remodeling trends have changed. Recently, homeowners have shifted their attention to newly invented materials like wood tile, comforts like heated tile and safety-focused age in place features like curbless showers. At Litchfield Builders we help homeowners bring their bathrooms up to date. We also work with homeowners to help them decide which features are most beneficial for their bathrooms and which features will be most valued into the future. Basement remodeling is a big commitment, so the decision to take on this home renovation project may not be easily made. 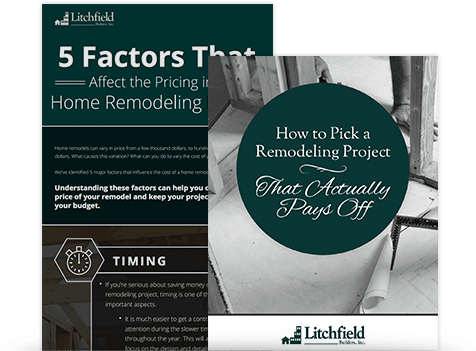 Expecting realistic outcomes and knowing the challenges of this type of project can help you decide whether or not basement remodeling is for you, what the scope of the project should be, and what qualities to look for in a contractor. Homeowners can save a lot of money by completing home improvements and renovations on their own. Unfortunately, some homeowners incur additional, unnecessary costs by failing to anticipate the problems that can arise during home renovations.